The state of Louisiana boasts 33 colleges and universities with nearly 250,000 student enrolled between its various public and private institutions. As the learning landscape changes and thousands more students enroll in online college programs nationwide, Louisiana schools are growing their online learning platforms to follow suit. This provides more opportunity for students who previously focused on work or family obligations to earn a college degree and increase their earning potential and job prospects. This page provides answers and resources for students interested in learning the ins and outs of how to choose an online college program in Louisiana. Many colleges in Louisiana offer amenities that can take a student's college experience to the next level, from high-powered sports teams to cutting-edge research facilities. But online students typically look for other qualities in their school choice: students who would appreciate extra career guidance might look for a college that offers career placement assistance, while others want flexibility guarantees that allow them to start an online program at any time of the year. Taking these types of online student support services into account alongside and fundamental quality measures, such as student-teacher ratios and depth and breadth of online programs, we’ve created a list of the top schools for online students in Louisiana below. Louisiana State University and Agricultural & Mechanical College, more commonly known as LSU, offers master's degrees and graduate certificates for online learners. Through LSU Online, students can dive into education, business, social work, construction management and other fields. Once enrolled, students can choose from six start dates. In addition to tech support with the Moodle learning system, other student resources include a robust library system, helpdesk, disability services, proctoring services for test-taking and the LSU Center for Academic Success. Online learning is front and center at Northwestern State University of Louisiana, where students can choose from 40 fully online programs. These include everything from the associate of general studies to the Doctor of Education or Doctor of Nursing Practice, though most online offerings are found at the master's level. Fast-track classes during the fall and spring are eight weeks long, while summer courses are four-week and eight-week commitments. Courses are delivered via Moodle and feature online lectures, discussion boards and online class meetings via WebEx. All students, including those from out-of-state, enjoy flat-rate tuition for online learning. From the associate in general studies to master's and specialist programs, McNeese State University offers programs through Louisiana Online, using the Moodle learning platform. Students can take advantage of generous transfer credit options and prior learning assessments to get a jump-start on degrees in field such as business, education, nursing, psychology, management and the like. Online learners can expect to participate in their online class at least three to five times per week. In addition to robust student resources for online students, special scholarships and financial aid options offered through McNeese State University put online learning in even closer reach. Students at Louisiana Tech University can choose from one bachelor's degree and several post-baccalaureate options in such fields as education, engineering, history and business. Students attend courses through the popular Moodle learning platform. They enjoy a wealth of resources during their time at Louisiana Tech, including the Office of Student Affairs/Advancement, full bookstore and library services, and much more. Through ULM Online, University of Louisiana at Monroe offers dozens of programs from associate to doctorate; fields of study include education, health sciences, business, behavioral sciences, humanities and general studies. Online programs for undergraduates follow an 8-week schedule, while graduate programs stick with the ULM semester schedule. As part of the school's commitment to distance learners, ULM Online students receive strong support services, such as personal advising, tech support and assistance with proctoring choices, among others. Offering distance learning since 2001, Louisiana State University ? Alexandria now has 10 degree programs entirely online, including those in criminal justice, English, psychology, elder care administration and more. Whether an associate or bachelor's degree, the programs require 120 hours of study ? a full two years for the associate degree and two years for bachelor completion. Students will enjoy the convenience of accelerated courses, multiple start dates, generous transfer credit acceptance and a free online orientation course. Building on a long history of academics, Loyola University New Orleans offers more than a dozen bachelor's, master's and doctorate programs in such fields as nursing, criminology and justice, mass communication, pastoral studies and more. The Plus-30 Credit-Completion Program is for anyone who earned a bachelor's degree but needs more hours in order to qualify for credentials in their field. All programs are entirely online, featuring asynchronous, accelerated courses that allow for the ultimate flexibility. At University of Louisiana at Lafayette, potential online learners take a readiness assessment to ensure they can handle the unique demands of online education; then they choose from four undergraduate degrees, six master's degrees, one doctorate (the Doctor of Nursing Practice) and three graduate certificate programs. These fully online programs begin with orientation in the Moodle platform, then a virtual meeting with an advisor. Once courses begin in earnest, students can look forward to excellent tech support, career counseling, online tutoring and library resources to help them make the most of their educational pursuits. From bachelor's to master's programs, University of New Orleans offers the opportunity for flexible, asynchronous learning as well as unique fields of study, such as Romance Languages, Urban Planning and Transportation. All courses are taught by UNO faculty members, assuring the same rigorous education as offered to on-campus counterparts. Students in online courses will use the Moodle learning platform, Adobe Connect for web conferencing, compressed video courses and some content on iTunes U. All the services of the robust university, including academic advising, career services and counseling services, are available to online students at UNO. Online students at Nicholls State University can choose from 15 diverse programs at the associate or bachelor's level, as well as a post-baccalaureate certificate in applied business. Students can complete their fully online courses in eight-week accelerated sessions, allowing a bachelor's degree to be completed in three years or less. Orientation to Nicholls Online prepares students for the rigors of distance learning; then students are ready to begin taking their first course through the Moodle learning platform. Courses begin in January, March, June, August and October. How can I find which online colleges offer the degree I'm looking for in Louisiana? The Louisiana Board of Regents offers a listing of the state's four university and community college systems along with an interactive map showing each institution in the state. However, because college programs are ever-evolving, students should contact their schools of interest directly for the latest information on their majors and courses offered online. You can usually find a list of their online programs on each college’s websites, like McNeese State University. This particular university is known for offering a wide variety of associate, bachelor's, master's and doctoral programs online, along with graduate-level certificate programs. This type of school is ideal for undergraduate students who might not have solidified a particular career direction yet. Which online schools in Louisiana will accept my transfer credits or work/life experience? Many schools view students' transcripts and previous schools' course catalogs when making transfer credit decisions—be prepared to provide this information when you ask about your transfer credits. Other schools may ask for a more detailed account of your educational, work and life experiences. At Nicholls State University, students should be prepared to submit course syllabi to the officials responsible for determining course equivalents. Work experience may translate into college credits after a portfolio assessment, which demonstrates industry knowledge and ability. McNeese State University even offers a course to help students develop their portfolio before it is considered by testing officers. Keep in mind, a class you previously took, even if it covers the same subject matter, will not always satisfy a particular college's degree requirements. How Much More Do College Grads in Louisiana Make? Students often hear that completing a college degree helps them earn higher salaries in the long run. This statement runs true in Louisiana, where occupations that require higher levels of education also pay, on average, higher salaries. Below is a glimpse at the average salary that Louisiana professionals earn based on the degree-level requirements of their job. One discrepancy in the general rise in salary for positions requiring higher degrees in Louisiana involves master's-level jobs. Careers requiring a master's degree may pay less per year than jobs requiring a bachelor's degree in some cases. This may be skewed due to high-paying jobs, such as business executives and sales managers, requiring only a bachelor-level education to pursue. Louisiana residents whose jobs require a doctoral degree might make nearly $87,000 more per year than their peers with no formal education, and $46,000 more than those working in jobs requiring a bachelor's degree. In Louisiana, economic assessments show less degree-intensive jobs in construction and shipbuilding are expected to continue to shrink in number over the next couple of years. The state's gas and oil extraction sector are also still considered to be recessionary, and may be replaced as high economic drivers by the ever-growing need for high-tech jobs. The healthcare sector is another industry that is anticipated to experience major growth, thus creating more job opportunities for college degree holders in Louisiana. An online degree is not any less distinguished or reputable than a degree earned by an on-campus student—if you’re attending an accredited college or university in Louisiana, that is. Accreditations demonstrates that an institution is meeting highly-regulated quality standards and provides students with the best possible education. Look for online colleges and universities in Louisiana who are accredited by the Southern Association of Colleges and Schools Commission on Colleges. One of seven regional accreditors for colleges in the U.S., this panel regulates schools in nearly a dozen states, including Texas, Alabama, Mississippi and Tennessee. 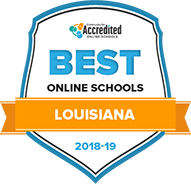 Along with being regionally accredited, today's top online schools in Louisiana may have received subject-specific accreditation for their various programs. For example, Louisiana State University's college of business is accredited by the Association to Advance Collegiate Schools of Business. This college offers an online MBA, and because of this accreditation, is assured to hold high educational and industry learning standards. Students who decide to complete a program at an online college in Louisiana can generally expect to pay in-state tuition rates no matter where they reside. For instance, the University of Louisiana Lafayette emphasizes that most of its online programs charge regular tuition, however, online students must pay a distance-learning fees to cover major course design enhancements and the acquisition of e-library collections. Louisiana students who want to complete programs that aren't offered in-state can complete their studies at one of several colleges in 14 other states that are part of the Academic Common Market and get their out-of-state tuition waived. The Academic Common Market is a reciprocity agreement between Louisiana and 14 states throughout the southern and eastern U.S.
What are Louisiana's requirements to qualify for in-state university tuition? In Louisiana, students can qualify for in-state tuition if they have lived in the state continuously for a year and have abandoned every previous non-Louisiana residence. They also cannot have been enrolled in college during the year leading up to the academic session during which they are requesting residency status. Are online credits more affordable in Louisiana than other places? Public college tuition in Louisiana is on the lower end at Southern University at New Orleans: It costs more than $6,400 and more than $15,300 for tuition and fees for in-state students and out-of-state students, respectively. Meanwhile, it remains on the high end at Louisiana State University and Agricultural and Mechanical College: it costs more than $11,000 and more than $28,000 for tuition and fees respectively for in-state students and out-of-state students. That puts Louisiana's tuition below the average total tuition cost at the country's public institutions (more than $16,700), except for in the case of out-of-state tuition at a more expensive school. How can I get help paying for online college in Louisiana? Louisiana Go Grant: This grant is available through the Louisiana Office of Student Financial Aid and is available to any high school graduate or current undergraduate who has financial need. Individuals 25 and older who are re-entering the college scene receive priority. The grant is valued at between $300 and $3,000. Stephen W. Cavanaugh Scholarship Fund: Students in Louisiana are eligible for this scholarship if they are full-time students majoring in an area such as risk management, business, finance, or actuarial science. The scholarship is valued $1,000 per semester over the course of four years ($8,000 total). Boudreaux Family Scholarship: This scholarship is available through the Baton Rouge Area Foundation for students graduating from Zachary High School and attending an accredited Louisiana college. Scholarship recipients receive $2,000 each semester ($4,000 each year). A minimum 2.5 GPA is necessary to be eligible. Adult education programs can be useful for students looking to brush up on classroom skills, be tested on basic college competencies, and develop technical abilities needed for general college readiness. Contact your local community college or visit the Louisiana Community and Technical Colleges website for more adult education resources.